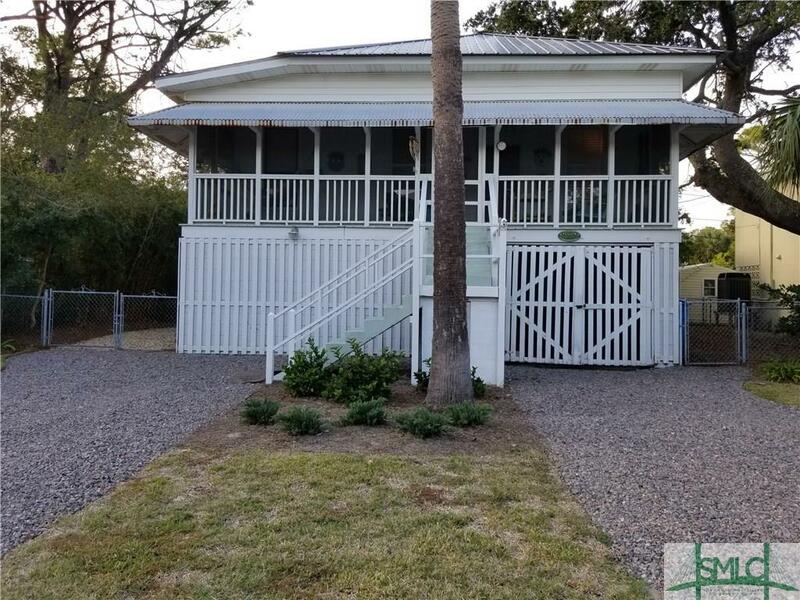 This 1935 historic raised Tybee cottage, complete with metal roof, original heart of pine flooring, bead board walls & ceilings, & peppered throughout with colored reclaimed wood that enhances its charm is a true treasure.The screened-in front porch welcomes you & you’ll be enchanted when entering the cottage with its vintage authenticity. In addition to the cozy living area, you’ll love the bath with its claw tub/shower & special features.The chef’s kitchen offers modern appliances, with a touch of nostalgic, including a deep farm sink, butcher block counter tops, & festive wall and ceiling bead board. Kitchen opens to a huge deck,with twin palm trees build around the wooden porch.The ground level provides plentiful storage as well as separate enclosure which is currently being used as a guest area.The sturdy foundation of the cottage was built with a combination of cured palm piers & beams, some of the palm trunks are exposed at the ground level as well as the enclosed living space.